Cosmetic eyelid surgery removes the excess fat and wrinkled, drooping skin of the upper eyelids that can make you look constantly tired or sad. It also eliminates bags under your eyes and tightens our lower eyelid skin. The result is a more alert and rested appearance. Dr. Kassabian will make tiny incisions along the natural lines of your eyelids, which results in minimal scarring in the upper eyelid. For the lower eyelid, the transconjunctival approach is usually used which is inside the eyelid resulting in no visible scarring. 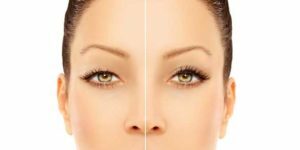 The procedure involves the removal of excess skin from the upper and/or lower lids and Dr. Kassabian may remove fat and tighten muscle to help you attain a fresher, more alert yet completely natural eye expression.